I’m back at the loom again after all that pattern-drawing and book lay-out work! I am way beyond the halfway hump now on my silk scarf project and am weaving the small paisley-like motifs between expanses of plain weave. There will be one more section of intensive patterning to match the beginning before I finish. I love sailing along through the plain-weave sections and I finally managed to do something I have been meaning to do all along, that is, make a short video of myself weaving a plain-weave section. I stopped myself just in time before I could finish one of the last plain-weave sections on this piece and took a short video. In the fuzzy screen shot at left, you will see that my cross sticks have caught up with my coil rod. When that happens it’s a message to me to unroll more unwoven warp from the far beam, roll the coil rod away, shift the cross sticks and heddles further away from the weaving line and continue. I did all that after filming. So it is a slightly cramped scene you will be seeing. Mind you, this is exactly how I will be forced to weave when I finally get to the end of the warp. The amount of working space I have will be greatly reduced. There is a lot of extra wood clacking sound just because everything is so close together. The black and white mess of string on the far beam are the loops I tied around all the individual warp sections as they came off the warping board. They serve no purpose there. I just haven’t bothered to cut them off. It is kind of amusing and interesting to watch video of myself weaving. I do some things so automatically and unconsciously…like the one-handed shuttle twirl that I do a couple of times at the start to release some thread from the shuttle. I had no idea I did that! And I think it’s funny how my strumming stick seems to be glued to my hand. I never put it down! It’s like a handy, extra pointy finger. I hope the video shows you a little about some of the possible movements I use to operate the loom and open those two basic sheds. Different sizes and textures of thread and yarn will behave in very different ways and I modify my moves accordingly. You can learn much more about these moves and set-ups and the way I use them to operate my loom in my video Operating a Backstrap Loom. It’s on dvd or available for lifetime streaming on Taproot Video. I have to give a million thanks to everyone who has bought my new pattern book so far and especially those who have sent me so much wonderful positive feedback. It’s heart-warming seeing it go out to so many places around the world like Taiwan, Slovenia and Israel. I feel that this new book completes a set. It is the natural companion to the instructional book, below left, that I published last September…. The wooden rigid heddle is a sweet little one that the folks at Vavstuga gave me when I first visited some years ago. That’s my tiny Ashford Inklette which surprised me by comfortably taking on 72 ends of #3 crochet cotton. I know you won’t be surprised to hear that I favor the backstrap set-up in the lower left picture. And that’s Julie’s Gilmore Mini Wave loom on the right, a loom that seems to be growing rapidly in popularity! Speaking of the Mini Wave loom, here is Marsha’s project on one in luscious tencel using a pattern from my instructional book, Complementary-warp Pick-up. I have loads of 8/2 tencel and have only used it once as warp. Marsha’s project reminds me that I must do something with it. The colors are so deep and rich..
Bonnie used a band she wove using another pattern from the instructional book to decorate a bill fold for her husband..
Claire had this fun and original idea to use her bands to secure the comfy pads for her spinning wheel. She made these bands in one of my classes and, yes, those patterns are in ”the book” too! Kathy packed up looms, sticks and tools to travel and escape the snow for a while and wove these gorgeous pieces. (You know where to find the patterns if you like them :-)). I love this earthy combination of colors. She uses Knitpicks Curio cotton combining some of their colors with some that she dyes herself. I like the Curio cotton because it is 2-ply but I agree that it could do with the addition of some richer colors. 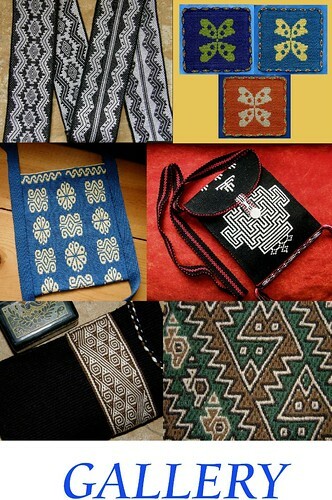 This is one of the Central Asian patterns that appears in the book alongside a nice border pattern that I like to call the ”cajitas” (little boxes). This beauty uses a pattern from my second book, More Adventures with Warp-faced Pick-up Patterns. I am not the only one who finds cable ties super handy! Diane is weaving this band to match and hang alongside the Mola on her wall. Isn’t it a great match? There is something very tribal about this combination of colors. She is weaving it more like a warp-dominant than a warp-faced piece and I like the way the dark weft looks in the places where it is slightly exposed.It has taken on such a different appearance that I didn’t recognize it at first as one of the patterns in my book. The fact that her weft is somewhat finer than the warp gives it a more compressed look too. It’s wonderful. A couple of posts ago I showed you Jan’s cuff with its exotic long twisted fringe. She has come up with a really cool use for that fringe! Marilyn spends half the year in Alaska and the other half in Mexico. I love that her backstrap gear and my books travel so well with her across all those latitudes. 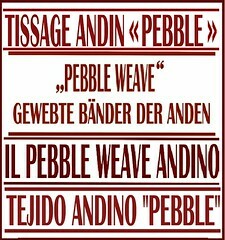 Here’s her latest Andean Pebble Weave band. Indigomargo has been piecing together various patterns to create her own original combinations and contribute to the Cuffs and Bracelets Weave-along on Ravelry which is still happily receiving new projects. She has her own neat ideas for adding button loops to her bands. Brittany has just joined us in bracelet-making too. Maja has been giving me exciting glimpses of this large wool project for some time. The patterns are from my second book. She has woven it with four selvedges and you can see her small terminal area toward the bottom where she had to close the gap between the two ends of weaving. She is currently experimenting with different structures to use to close the gap rather than using plain weave. And, I am really excited to show you what my weaving friends up in the highlands have been doing with the copy of my second book that I left up there on my last visit. These pictures were sent to me by Dorinda. Antonia wove a band of various patterns. She copies them from the photos in my book. The ladies love these brighter colors and it leaves me wondering why I don’t weave orange and pink together with a green border. It looks spectacular! Maxima has woven one too. You will all know Max well if you follow my blog. That’s her on the left. The other lady is Beatris. I didn’t get to meet and weave with her on my last visit as she lives in another community much further away. Dorinda tells me that she particularly enjoyed learning new patterns and is the only one who can read the patterns from the charts rather than from the photos. We all love learning new patterns! Thank you so much everyone for all your feedback in the form of words and clicks of ”like” and ”love” buttons on the various social media sites and especially for all the messages I get with pictures of your beautiful weaving! I can’t wait to get the first messages with pictures of things made using my latest book. And, the instructional companion book is now also available in German! 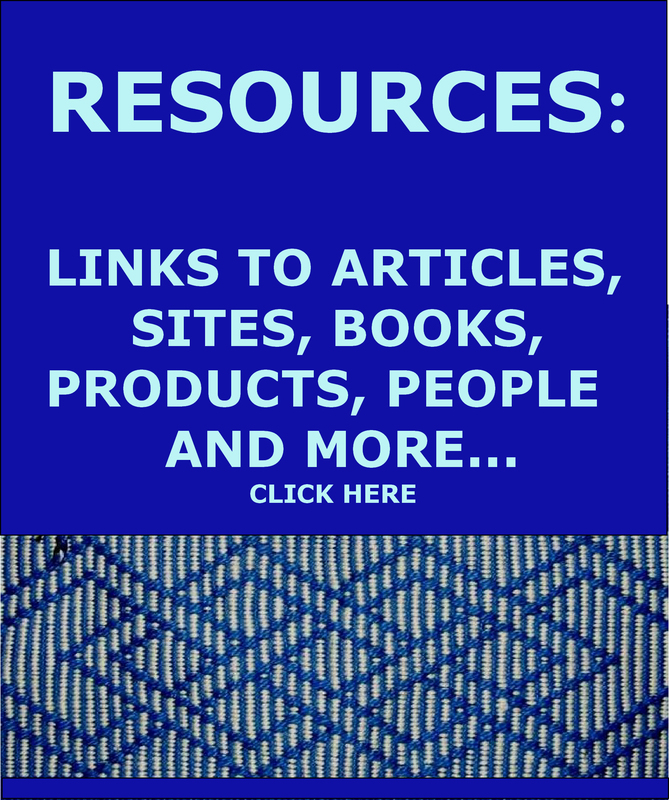 « Backstrap Weaving – My New E-book of Patterns! ¡Felicitaciones por los libros y los trabajos tan bellos! It’s so much fun to watch you weave! Hi Kristin! I am glad you like the video. Thanks for stopping by to say hi. Your comment about your one-hand twirl made me pay closer attention and learn something else: you use 2 swords to open the shed rod shed — one on either side of the heddles and you leave the first standing in place until you change sheds. I guess I never really thought about it. It helps to watch other weavers in action. Remember when we met at your class in Sydney at your brother’s? Even though it was a beginner class and I wasn’t exactly a beginner, I learned much from watching an experienced teacher in person. Thanks for these years of online, in person and printed instruction! Many backstrap weavers use a shed rod of much larger girth (even quite large pieces of pvc pipe) and then simply draw it down to the heddles to raise the threads in that shed rather than use a sword like I do. I like a slimmer shed rod and I like it bound to a second rod in a cross because I feel it makes it much easier to raise the heddles…less effort and with the least amount of abrasion. The downside, in that it takes slightly longer and requires one more tool, is having to use two swords, as you note, to open the shed-rod shed but you get into a rhythm and I find it is a very smooth process. I don’t think I leave the first sword in the shed on the far side of the heddles for any particular reason. You just find a way and try to stick with it to make the whole sequence more efficient. I am sure that sometimes I might remove that sword earlier without even noticing I have done so. I am so glad you have found the video useful, Jim. Thanks for taking the time to comment. Hola. Muchas felicidades por sus libros. Hay alguna posibilidad de que sean traducidos al español. Hola Mariu. Mi primer libro ha sido traducido al español. Este libro tiene las instrucciones. El último libro no necesita traducción porque tiene principalmente los gráficos de patrones. Thank you as always, Laverne. I love the plain weave video and your blog. it is so helpful. 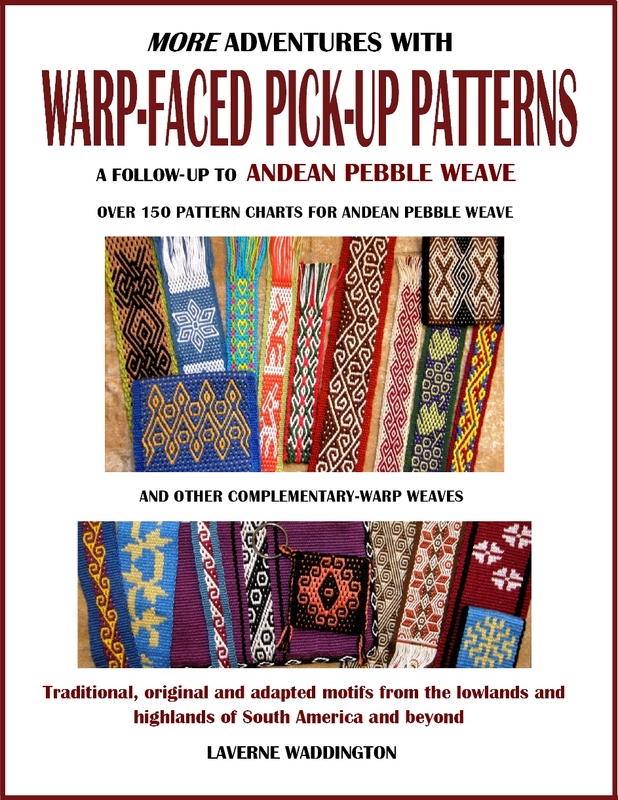 I am about to start weaving again – coming up to speed for our next workshops. I can’t wait. Seeing photos of various weavers’ projects really helps. It is great to have lots of ideas of small project to do as a beginner. Thank you so much for all your hard work, your willingness to share you knowledge and your wonderful blog. Your new book is fantastic! I just wish that I had more time to weave. 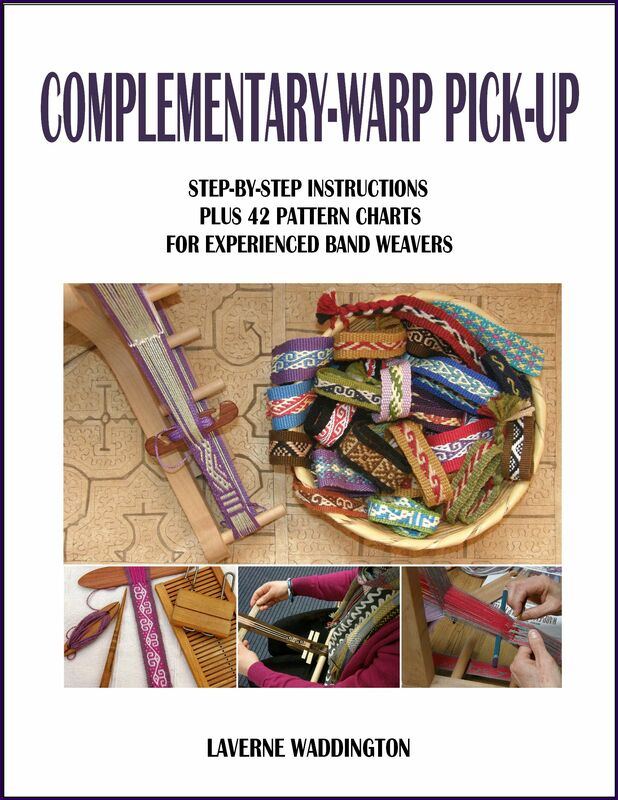 I just finished a supplementary warp pick up band. Next, I’ll put a warp on my Wave loom for a pebble weave band. But first, I have a bit of sampling to do. I want to make a guitar strap with, hopefully, a motif that resemble the Star Trek emblem on it, for my Star Trek obsessed geeky son. I need to figure out the design! 🙂 I’ve been poring over your books for days now. We’ll see what happens. 🙂 Thanks for the inspiration.